Originally Sir Arthur Conan Doyle named the sleuth Sherrinford but changed his mind – perhaps because there were well-known Nottingham cricketers called Sherwin and Shacklock and the author was a big fan of the sport. There are notes in the Museum of London that suggest both characters might have had very different names. Conan Doyle was so impressed by Dr Joseph Bell, a lecturer at the University of Edinburgh, who could diagnose patients on sight, that he based Sherlock’s skills of perception on him. His first adventure was rejected by several publishers and printed in Beeton’s Christmas Annual, which was not a success. …or at least, the most popular human character! He’s been in 226 films while Dracula has been in 239! With the first silent version – Sherlock Holmes Baffled – made in 1900. It feels like everything we know is a lie! While the detective says ‘elementary’ and ‘my dear Watson’ several times, he never puts the two together. Although he’s often given a bigger role in TV shows and films, Sherlock’s brother Mycroft actually only appears in The Greek Interpreter and The Bruce-Partington Plans. In the story The Bruce-Partington Plans, Sherlock is invited to Windsor to meet Queen Victoria in recognition of his services, and is presented with an emerald tiepin. After two years of writing the popular stories, the author was sick of the detective, and complained ‘it takes my mind from other things’. In the 1969 Oxford-Cambridge chess match, Oxford players called Watson and Holmes both won their games. It’s actually at number 239. Or at least that’s what a man called John Radford estimates in his book The Intelligence of Sherlock Holmes and other Three-Pipe Problems. The average is between 100 and 110, while Einstein’s was 160. Yes, despite being a fictional character, the RSC offered him a fellowship in 2002, and presented his award to Dr John Watson (a real man who is also a fellow!) 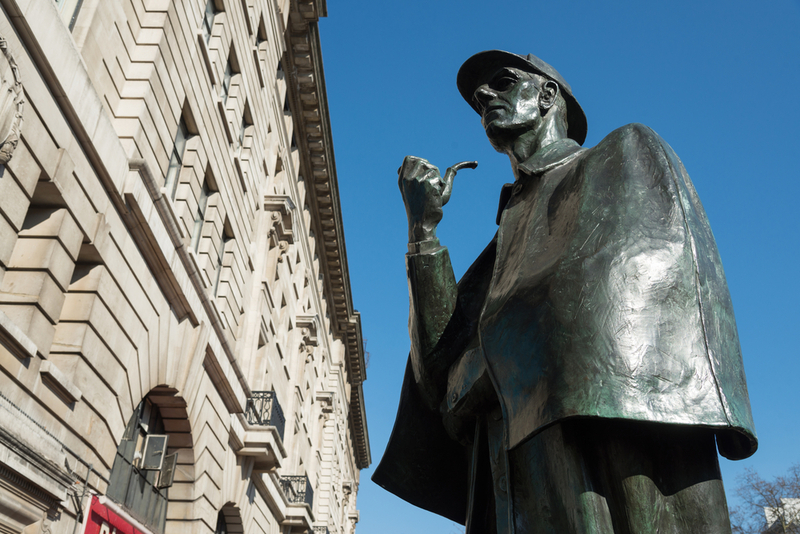 in front of the statue of Holmes outside Baker Street station. Not only was it Conan Doyle’s favourite, but it frequently tops reader polls.